Flowers express various emotions and sending a single bud, a bouquet, or a basket is a sure fire way to cheer up the mothers in your life. Red roses for your wife, spring flowers for your mom, carnations for grandma… Flowers express various emotions and sending a single bud, a bouquet, or a basket is a sure fire way to cheer up the mothers in your life, particularly on Mother’s Day. Widely known as flower of love, roses have remained the popular choice to send on any occasion, as testified by Gidget Espinosa, proprietor of The Florabella flower shop and online store. But thanks to many florists who have been propagating flower information to the public through various media, other varieties have also made it to flower shop’s bestseller list. While it’s true that a plain single flower can convey your message, giving it a little extra effort and creativity adds to the flower’s natural allure. This is the reason The Florabella gives their orders personal and special attention. “We often ask the favorite color of the recipient and the occasion. Most flowers have corresponding meanings, and from there we make suggestions,” says Gidget, who grew up in a family of florists and has 14 years experience in flower shop management and 10 years in online business. The Florabella has an online flower dictionary which can serve as your guide: red rose, as well as red tulip means love; light pink rose connotes admiration while the deep pink variety implies gratitude; yellow rose expresses friendship; white rose and white carnation mean innocence and purity; daisy means loyal love; and sunflower, adoration. The flower shop’s floral arrangement service extends from a single rose to a wedding arrangement. Gidget says they keep up with the trends and constantly innovate in accordance to their customers’ preferences. Traditionally, bouquets are arranged perfectly but aside from offering such arrangement, The Florabella also does loosely tied bouquets that look like the flowers were just gathered from a garden. They use a wide mix of flowers to match the customer’s preferred color scheme, too. For containers, they use antique pots and colored vases in addition to the traditional vase. 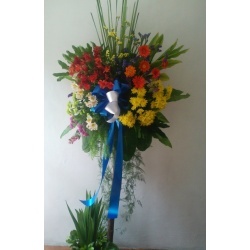 There are two ways to order and send flowers through The Florabella: people can visit the shop in Makati or order online at their website (www.florabella.com.ph). As a member of Teleflora Worldwide, the largest family of high-quality, expert florists in the world, they can deliver nationwide and worldwide. 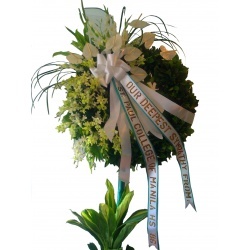 “We pride ourselves as a florist with secure flower delivery within the Philippines and worldwide backed by reliable service, on-time delivery, and very budget-friendly pricing,” claims Gidget. In expressing your deepest emotions, you can’t go wrong with flowers. This Mother’s Day, say your love, admiration, and gratitude to the mothers in your life – your mom, wife, grandma, sister, friend or boss – through flowers.